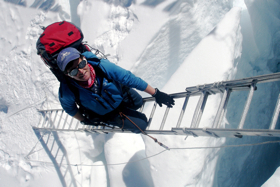 On March 5, Dr. TA Loeffler set out on a 600 kilometre traverse of the High Himalaya in Nepal. The HKR professor, along with her partner Marion Wissink from the Department of Computer Science, and two others left with the goal of walking one million steps over 65 days and 600 kilometres: 1,108,898 steps later (give or take one or two) their mission was accomplished. The trek started in in Taplejung, Nepal. They gained more than 25,000 metres in elevation and crossed four regions: Kanchenjunga, Makalu Barun, Everest, and Rolwaling, finishing the walk near the highway that links Nepal to Tibet. Part of the adventure was The Great Big Walk, which involved using curriculum materials developed by HKR 4210 students to engage elementary students in social studies, physical activity and geography. Grade four and five were able to interact with the group in the field through regular communication, thanks to funding from Memorial’s Quick Start Fund for Community Engagement. Dr. Loeffler is also the ambassador for Recreation Newfoundland and Labrador‘s Find Your Fit campaign, which was launched at the same time as The Great Big Walk. It fit in perfectly with her goals to reach out to people, encouraging them to be more active and talking about the benefits of walking. They posted their location, did an audio update on the day’s adventure, and shared all that they learned about the landscapes and cultures they were traveling through. Dr. Loeffler says the only thing that really surprised her about this adventure was how hard it was to come home and stop walking. You are such an inspiration. I can feel and imagine the peace you’ve obtained from walking every day!